only 36% of people believe that humans are entirely or mainly the cause of climate change. A majority (53%) believe that it is caused equally by human activity and natural processes, while 9% think it is mainly or entirely happening naturally. Only 25% of people are very or extremely worried about climate change. 45% are just somewhat worried, and 28% are either “not very” or “not at all worried” about it. The survey also looked at attitudes to work and the economy, social cohesion / division, and of course, Brexit. Full details of the survey results on climate change are in a separate document. As with most other surveys, they found that older people are less worried than the young. The proportion of people saying that climate change is mainly due to human activity is lower than in some other surveys, but that’s probably because they were given the option “Equally human activity and natural processes”, which most 53% opted for, as noted above. Opinions on personal responsibility were pretty lukewarm, with an average figure of 6 on a 10-point scale for feeling personal responsibility to reduce climate change. Overall, these findings reveal that, on average people in Britain are only “somewhat worried” about climate change, and they do not feel a strong sense of personal responsibility to try to reduce it. When asked whether it’s likely that large numbers of people will limit their energy use to reduce climate change, again on a 10-point scale, the average was only 3.8. Confidence was also low (4.3) on the likelihood of governments taking significant action globally. 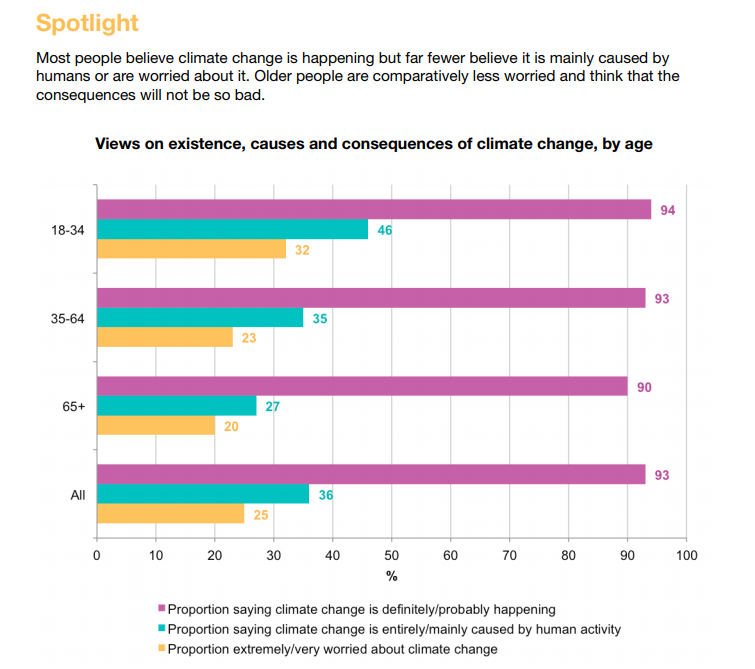 The survey also looked at how climate concerns relate to political views, and found a modest connection, with Conservatives and Brexiteers being a bit less worried about climate change. In fact, there seemed to be a stronger link with the Brexit issue than with the Conservative/Labour divide (something that we’ve noted here previously). Overall, it appears that Britain is relatively relaxed about climate change, and not strongly divided over it. There are more worried than there are sceptical individuals, but the majority in Britain appears to have fairly middling attitudes towards climate change. They know about it, and acknowledge a human component, but are overall relatively indifferent and apathetic about climate change.